Four chapters pertaining to British Columbia are included in Western Wanderings: A Road of Travel in the Evening Land (London. Richard Bentley and Son, 1874). In chapters 19 to 21, he describes some of his fishing experiences. J.W. 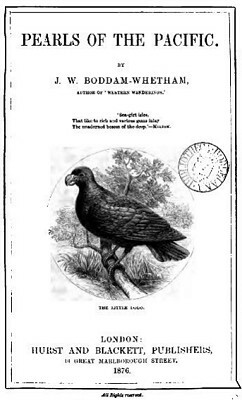 Boddam-Whetham was born in 1843. He also wrote Pearls of the Pacific (Hurst and Blackett, London, 1876), a travel memoir of Polynesia and Australia, plus Across Central America (London, 1877) and the cumbersomely titled Roraima and British Guiana with a Glance at Bermuda, the West Indies and the Spanish Main (London, Hurst and Blackett Publishers, 1879).